Rumor: Mario + Rabbids Kingdom Battle crossover RPG for Switch due out in August or September -- Snowdrop engine, turn-based combat, and two-player co-op. 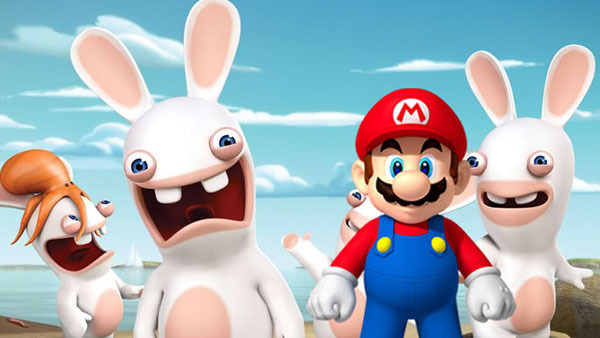 The Mario and Rabbids crossover RPG for Switch first rumored by Laura Kate Dale last November is real, according to Kotaku sources. It is reportedly titled Mario + Rabbids Kingdom Battle and will launch in August or September. Kotaku got hold of assets from the game that they were asked not to share. The assets allegedly reveal the game is developed on Ubisoft’s Snowdrop engine, the same engine that powered The Division, and that it features turn-based combat, two-player local co-op, and “a goofy sense of humor,” as Kotaku notes the artwork features Mario and friends wielding guns that shoot laser beams. There will apparently be eight playable characters: Mario, Luigi, Yoshi, Peach, and four Rabbids dressed up as Mario, Luigi, Yoshi, and Peach. Given its supposed August / September release window, it is likely Mario + Rabbids Kingdom Battle will appear at E3 2017 in June, or perhaps even before then.